Relationships are hard. I know that, you know that, your mom knows that, you elementary school teacher knows that. No one is going to sit here and tell you that relationships are easy. They only do that when they don’t know what the heck they are talking about. Getting to know someone can be hard. T.V. presents it like you’re supposed to know the ins and outs of someone else right away. They make it sound like if you don’t then you’re not compatible. That isn’t the case, not really. Of course, it is important to know how to talk to your partner. There is no one way to get to know someone, and it can be hard to know where to start. I think it can be scary to realize that you might not actually understand your partner as well as you should. Luckily, there are a lot of different style games out there that can help you along. You might not know what to talk about, but there are games that can help you navigate those tricky waters. Spending time together is a common hallmark of a relationship. Why not use that time to strengthen your relationship? There are games out there to help you spend time with one another and also learn simultaneously. Not everything has to be serious from the get go. My marriage started out with a lot of laughter and awkward moments. I see no reason that people can’t continue along that humorous vein for a while. We love playing games that help strengthen our bond. Learning about each other is never boring. Games like these bring up topics or questions that we wouldn’t think of otherwise, especially because it’s hard to be original. So cut out the distractions and let’s get started. Here are some conversation starters for better relationships. This game is great to use with just you and your partner. It can help you open up and discover new things about one another, both serious and not-so-serious. A great excuse to spend time together, this game is a great choice.  QUALITY TIME - for you and your partner - Enjoy date night in a completely new way. This toy for couples is a sure fire way to get the sparks flying between you two! It will get you out of your comfort zone and remind you why you are together in the first place.  COUPLES WHO MAKE TIME FOR EACH OTHER, STAY TOGETHER - It's important that your relationship is both mental and physical and one definitely leads to the other. Nothing could be sexier than showing your partner you care and you can do that just by asking a question and listening to the answer.  LEARN ABOUT EACH OTHER - Whether it's a first date or you've been together for years. Interact with your partner and get closer than ever. Games add joy to life and relieve stress and we could all do with some of that.  FOCUS ON EACH OTHER - Sharing laughter and fun can foster empathy, compassion, trust, and intimacy with others. Put aside the day-to-day thoughts and worries and focus only on the game and your partner. Not all the cards are related to romantic topics and this is certainly a game for any couple. It's our way of taking back our lives from the stress of work, family, friends and general day to day events. This is YOUR TIME enjoy it together!  BEST THING EVER FOR CAR TRAVEL - This question box to go is loaded with 100 questions and different topics and is ideal for roadtrips, camping and other outdoor activities. This is also a road trip essentials couples friendly game, which makes a great anniversary gift for him or her. BUY IT NOW! There is no risk. If you are unhappy just return within 30 days for a full refund. Order 2 or more to QUALIFY for FREE SHIPPING Today! Playing with groups can be just as fun as playing with games, that is why this is a wonderful choice for parties. With over 200 questions it can keep you learning and laughing for more than one game. It is also mean to be diverse and inclusive, so the questions work for any type of orientation. 200 conversation starters FOR COUPLES. That's 40% MORE than other games out there! Although we designed it for couples, it works GREAT FOR GROUPS! Strengthen all your Relationships! YOU HAVE NEVER HAD THESE CONVERSATIONS! We are 99.9% sure you'll find something new out about your partner EVERY TIME (if you don't, you are weirdly awesome). Great unique and fun GIFT for WEDDINGS, ENGAGEMENTS and ANNIVERSARIES! A more casual style game such as this is appropriate for lighthearted parties to get to know everyone. Don’t take things so seriously and just play along. If you want to learn about your friends or co-workers then this is the right game for you. Guaranteed to entertain in even the most awkward situations, questions range from hilarious to thought-provoking, and every question is perfectly appropriate for any combination of friends and acquaintances. Do you feel as if you and your partner have run out of things to talk about? Then this game is perfect to help you feel fresh and informed. These questions are designed to start conversation and then keep it going long after you’ve put the cards down. 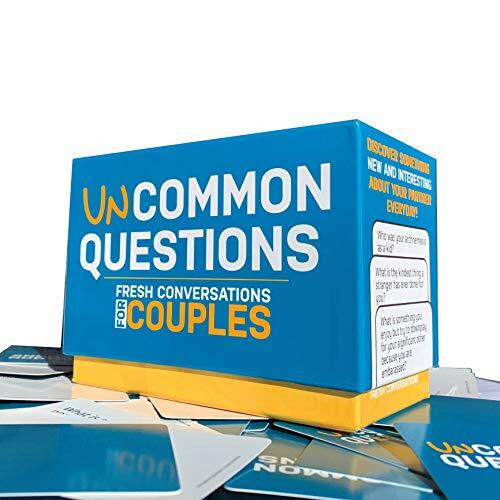 These conversation starters for couples include thought-provoking questions for couples to get to know each other on a new level. 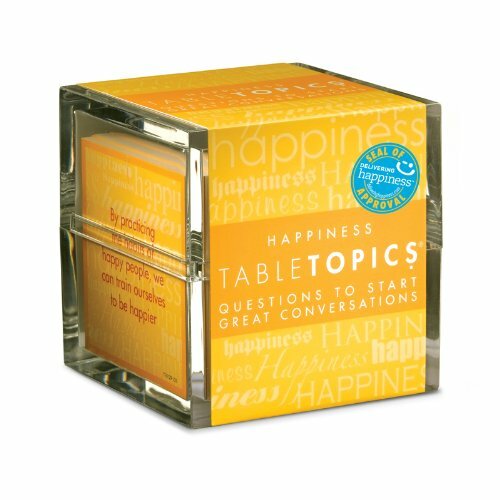 Top pick for an anniversary gift or therapy game, and is an entertaining choice for a couples board game. 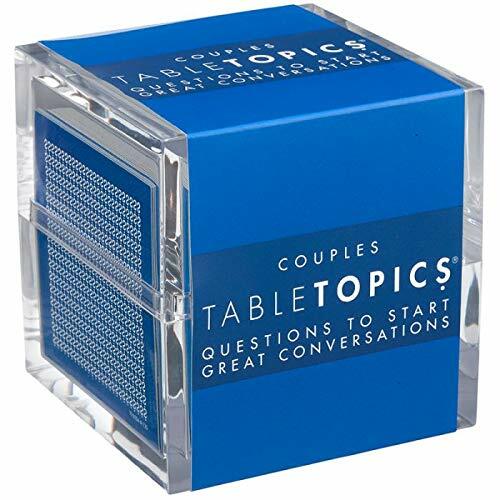 With 20 different editions and more than 2 million copies sold, TableTopics are the #1 best-selling conversation starters. Which of us is the worst backseat driver? How much do we need in the bank to feel secure? Is it our similarities or our differences that attract us to each other? What's the best thing you learned from your mother? A travel sized game for those long road trips or nights you want to stay in and cozy up. This game is portable and intimate and asks those questions you might not think of or be ready for alone. Hope you enjoyed our review and it benefits you in some way!